IT budgets in the UK are set to grow by 3.6% this year, compared with an average of 3% for Europe. As the economy recovers, some 30% of UK IT professionals (29% Europe) said their priority would be to expand the use of IT to grow their business. Just over a quarter will concentrate their IT spending in a few strategic areas this year, while 13% plan to maintain service levels with flat budgets. The survey found that 18% of IT professionals will increase there budget by 10%, while 19% said their IT budget will increase by between 5-10%. 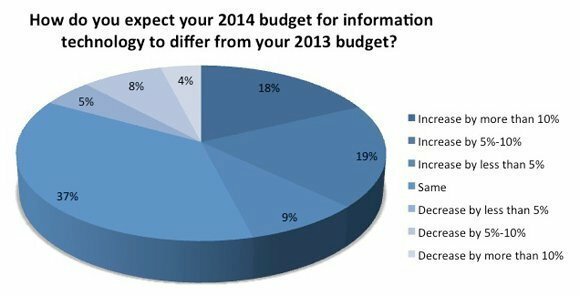 However, around 17% admitted their budgets would be going down in 2014. Download our IT Priorities 2014 Report. Top European IT initiative to support business in 2014?